IF YOU’RE SWELTERING IN THE SUMMER HEAT, you probably won’t relate, but here in the Northwest, we still have plenty of cool-ish, windy days and rain. I think it’s perfect weather for bread baking, which is an activity I thoroughly enjoy. And isn’t summer made for pleasurable activities? Cloud watching is another of my favorite pastimes these days. Any time of the year. 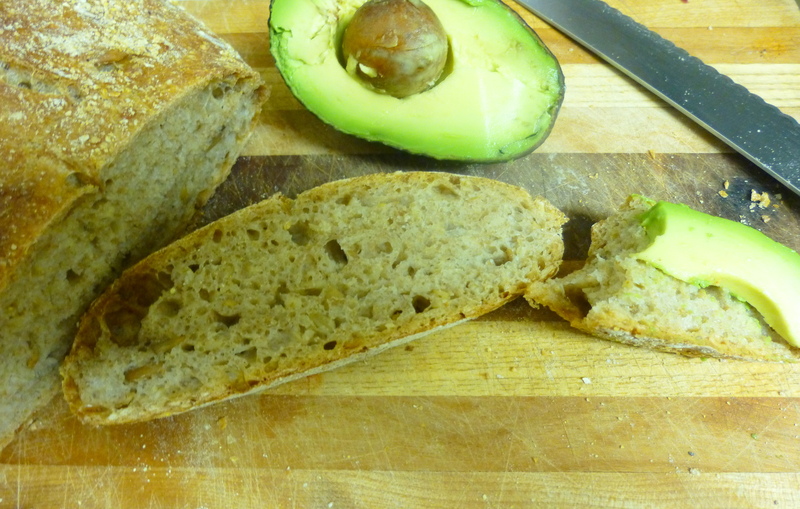 Lately, inspired by my son Zak’s incredible breads, I’ve been experimenting with a hybrid (hy-bread?) method of bread making, combining the Jim Lahey no-knead method, with, yes, a little bit of kneading and shaping using sourdough starter (1/3 cup approximately for one loaf) along with a tiny bit (1/4 teaspoon or less) of yeast. I’ve also been increasing the proportion of whole wheat/ whole grains, with varying success. This loaf I baked yesterday, about 50 percent whole wheat, rated a photo and is being enjoyed in sandwiches today and toast tomorrow. Actually, as I write this, it isn’t quite officially summer yet. Maybe soon my cooking plans will turn to potato salads or berry jams. But it’s very likely that there will also be more good bread-baking days ahead here in the Northwest corner. . . The aluminum pan makes it easy to give a generous amount of homemade cinnamon rolls. No returns necessary. OF COURSE THE BEST FOOD GIFT is (usually) something homemade. A lot of cookies and candy are exchanged this time of year, and I’ve enjoyed some marvelous biscotti, truffles and shortbread, but in years past I’ve also received homemade applesauce, spaghetti sauce, flavored vinegar and herbal salt, among other edible delights. 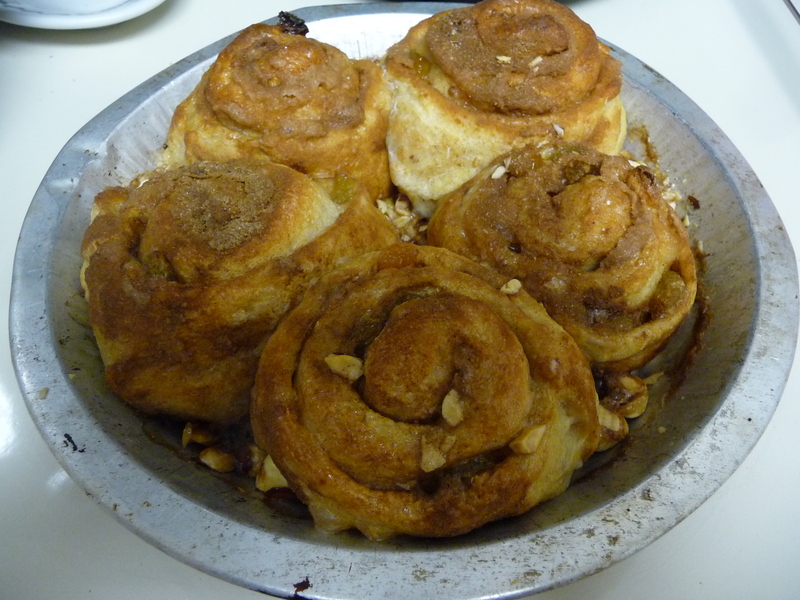 This week I made a couple pans of cinnamon rolls for my neighbors, and another for a special breakfast at home. They have some wheat and spelt flour along with all-purpose flour, no frosting and very little fat — so while I wouldn’t say they were “healthy,” they are not too destructive. And they have plenty of cinnamon and raisins, with a few walnuts on the top. My basic recipe is here. Cinnamon rolls are more flexible than you might think. You could add other spices (cardamom), leave out the raisins or the nuts or add in some different things (dried cranberries and pistachios?) You can make the dough and shape the rolls the night before you want to bake them, and they will rise in the refrigerator. Once baked, they can be frozen or reheated. CINNAMON ROLLS will make your house smell wonderful. And, best of all — if your neighbors are anything like mine — are the big smiles you’ll get when you appear at your neighbor’s door with a pan of the rolls, still warm from the oven. When I wrote the last post, more than three weeks ago, I was looking forward to getting my cast off and getting back to work in the kitchen. But those first days out of the cast were discouraging. My hand was so stiff and weak it was basically useless. Fortunately, I soon met with an occupational therapist who showed me how I could slowly but surely train my hand to work again. One of the things he had me do was to knead and grasp and pull a wad of therapy putty. I brought some putty home to work with, but I also thought that bread dough might be a nice alternative material. So I have been kneading dough ever since, and the results have been quite tasty. Here’s some of the baked goods I’ve been making the last few weeks. 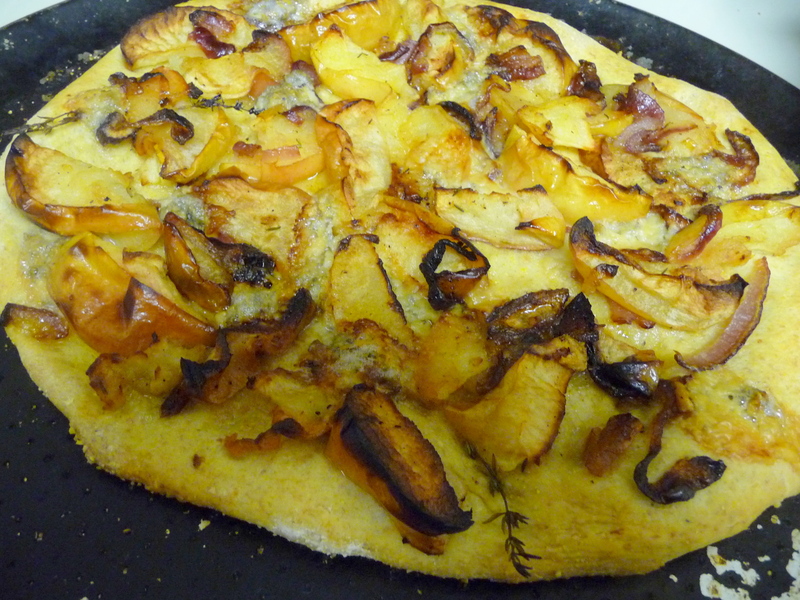 Last weekend I made a kind of pizza with a cornmeal-y crust, topped with roasted apples, red onions and blue cheese. It was inspired by Melissa Clark’s apple tart in The New York Times (but I substituted red onion for the shallot and didn’t use all that oil in the dough). Very nice for dinner or hors d’oeuvres. 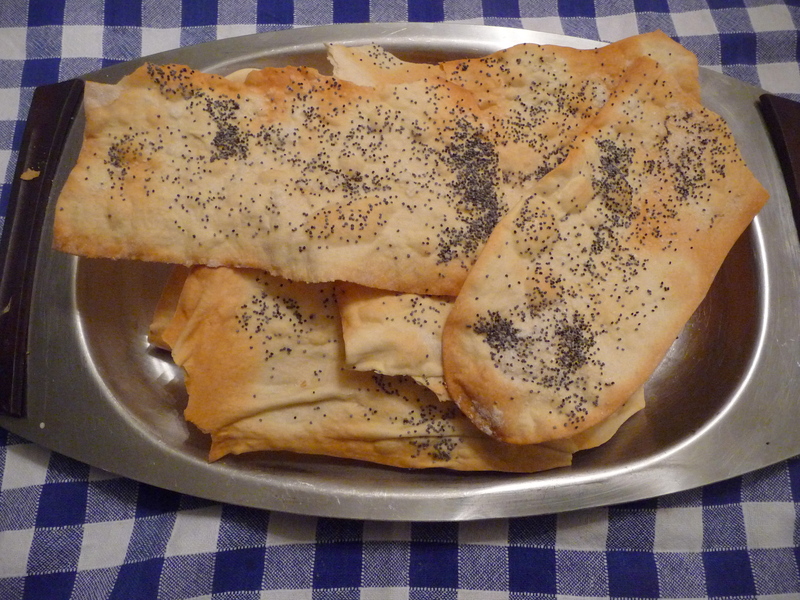 And today I made lavash crackers, with a recipe that came originally from Yvette van Boven’s Home Made cookbook. I kneaded the dough for a good 8 minutes (my right hand helped just a little) and rolled it out into sheets in my pasta maker. My goodness — what nice crisp crackers! 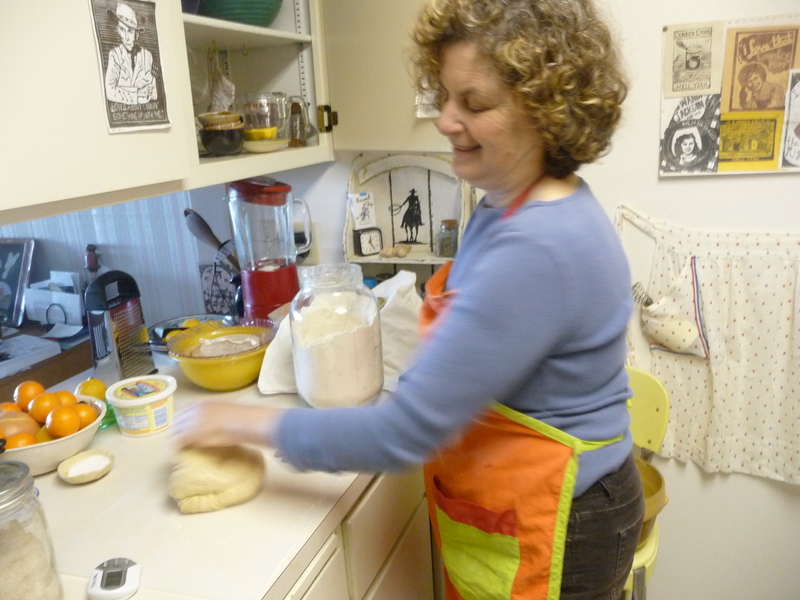 Usually, I love to knead bread dough and find it relaxing, almost meditative. But it hasn’t been like that at all lately. I make my weak left hand do the work and it hurts. But it is therapeutic. And the results are doubly appreciated. 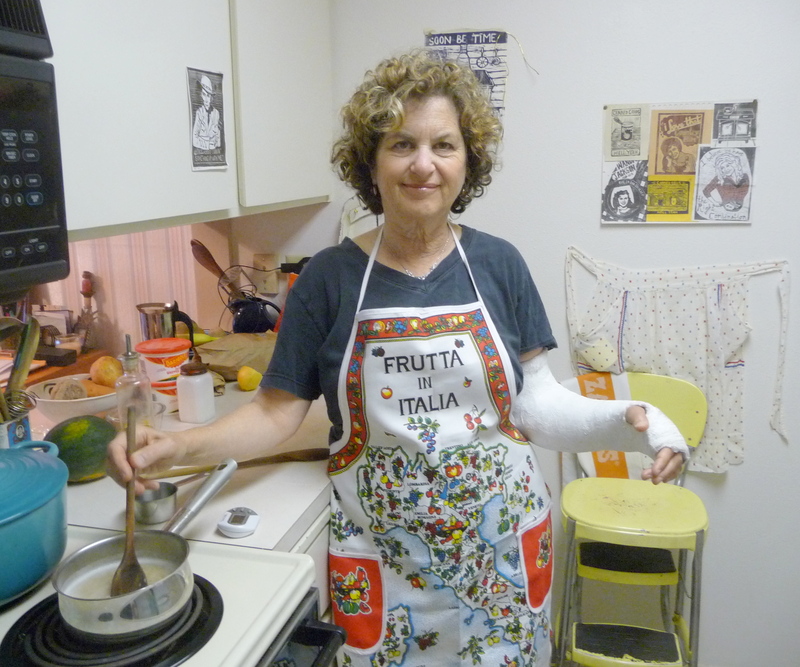 I returned from my trip to Italy (with dear friend Cathy Mihalik) with a new ‘Frutta di Italia’ apron — and a very heavy full-arm plaster cast! 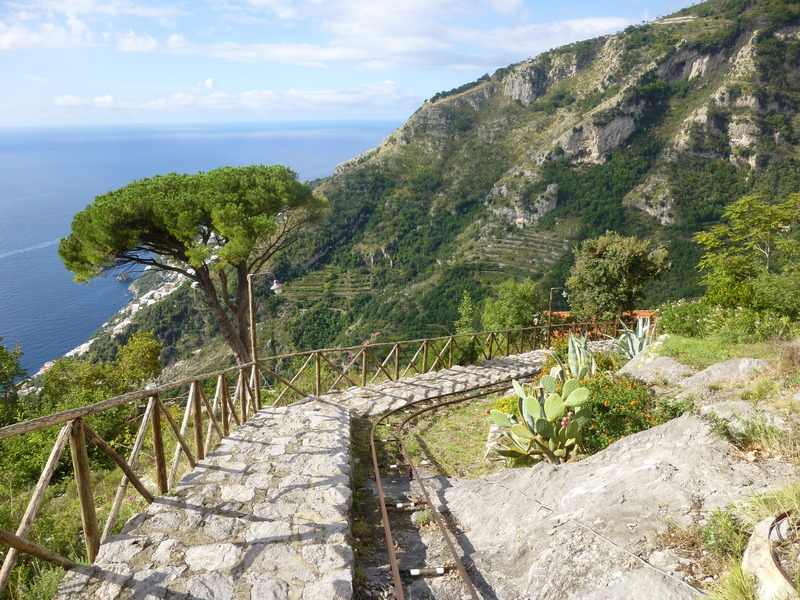 Hiking down a steep and beautiful trail (Sentiero Pennino, part mule track, from the wonderful agriturismo in the hills, Serafina, to the town of Bomerano), I slipped on some loose gravel by la grotta di Santa Barbara. I stuck out my left hand to cushion the fall and — BAM! — broken wrist and a displaced radius bone. (In orthopedic jargon, this very common route to a wrist fracture is nicknamed FOOSH for Fall On Out Stretched Hand). 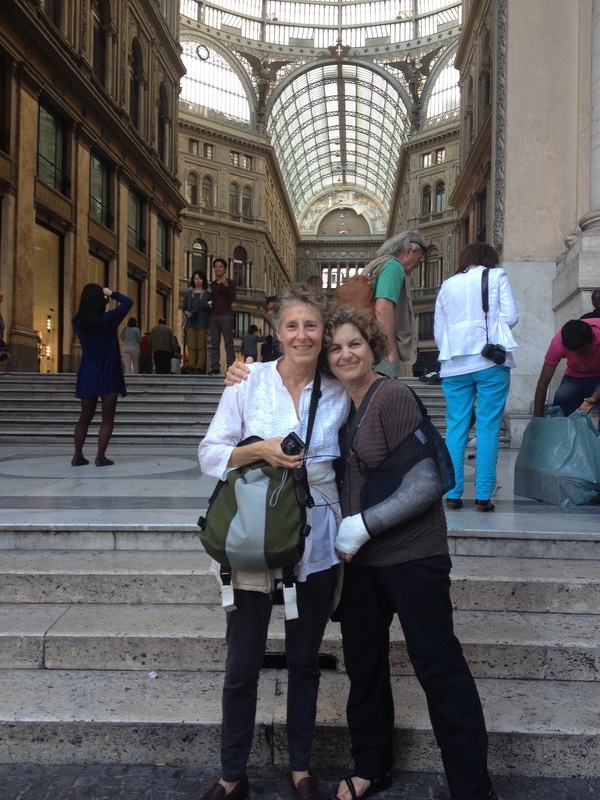 The next day, in a hospital outside Naples, the orthopedic doctor pulled the bone into place without anesthetic (ouch) and gave me a plaster cast from above the elbow to below the first joints of my fingers. About that cast: “Positively medieval,” my friend Nia called it. The orthopedic nurse in the U.S. updated the description a little, but said she hadn’t seen the like since the 1970s. She cut off the cast, plaster dust flying, and discarded it with a look of disgust. “Some things are better left behind,” she said. 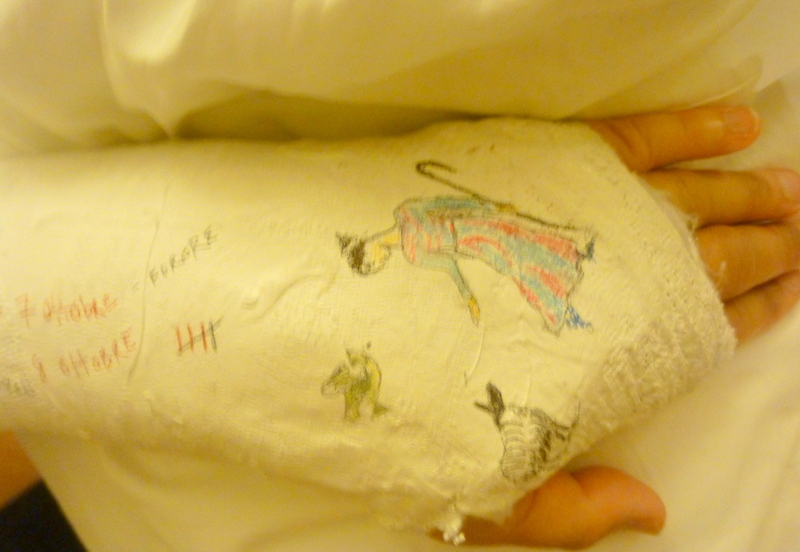 The only thing I miss about the cast is the charming picture Cathy drew of a shepherdess and lamb. The worst part? When I met with the orthopedic physician at home two-and-a-half weeks after the fall — and learned that the bone had not healed at all. In fact, it looked worse than the day I fell! I was scheduled for surgery subito (immediately). Well, I plan to write a post about the frustrations, challenges and amusements of one-handed cooking soon. But today I am just lazing about, recuperating from yesterday’s surgery and thinking about what a delicious duo Steve made for me when we came home from our 9-to-5 day at the hospital. I’d had nothing to eat or drink all day and I was a little weak and woozy. It was very simple but Steve made it perfectly: tea. 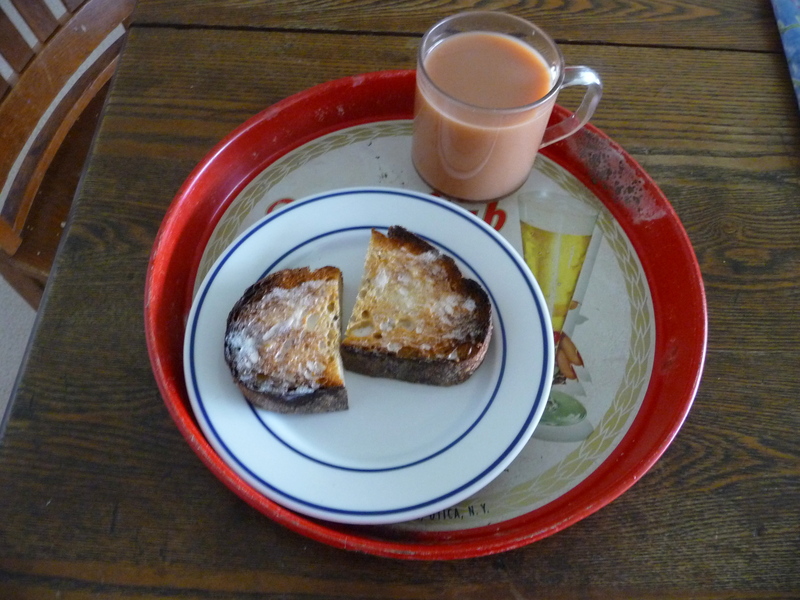 just how I like it (PG Tips with milk) and buttered toast (multi-grain from our excellent local bakery, Breadfarm). Maybe it was because of the trauma or the hunger or the appreciation of Steve’s kindness, or all those things rolled into one. All I know is, that tea and toast was so delicious it seemed like the best thing I had ever eaten. And perhaps it was. My son (who’s an incredible home baker) gave me some sourdough starter a couple months ago and told me I should give sourdough another try. I had failed to maintain a sourdough a couple years ago, and had given up on it — but this was a gift from Zak, so how could I refuse? Well, Zak’s starter is so lively and tolerant that it has me hooked. It survived the long car trip from California and a few weeks of neglect when I was too busy to bake bread. As long as it’s fed (water and flour) from time to time, it’s in bubbly good spirits. And that wonderful starter has been inspiring me to make bread quite a bit lately — which has warmed up our apartment nicely during this cold spring. 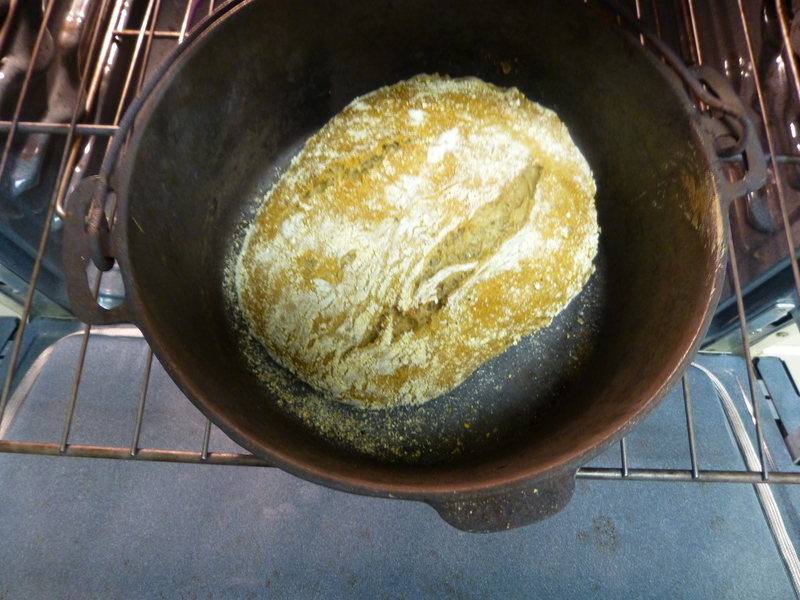 I’ve mostly been using the Dutch oven method, in which the combination of a wet dough and a very hot oven-like pan makes for a crusty European-style bread. 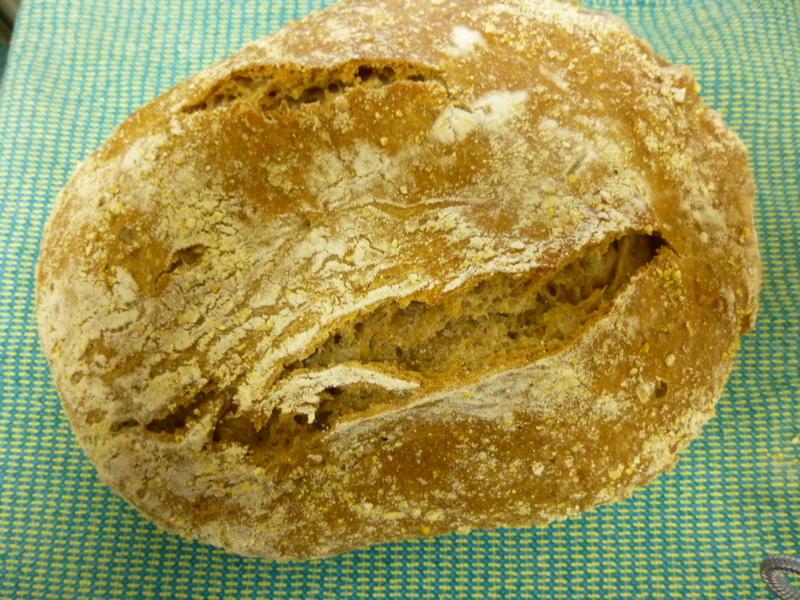 My current favorite is a hearty bread similar to the one I discussed in this post (which was also in praise of German bread) but using 1/4 to 1/2 cup of sourdough starter in place of the yeast, and adjusting a bit for the additional liquid of the starter. I bake it (in a Dutch oven preheated in a 450-degree oven) for 25 minutes with the lid on, and 15 minutes with the lid off. The dough I’ve been using has approximately 1 cup bread flour, 1 cup whole wheat flour, 1/2 cup rye and 1/2 cup oatmeal, some sunflower, flax, sesame and poppy seeds and 1 1/2 teaspoons of salt — plus scant half cup of starter and about 1 1/2 cups of water. I say approximately, because I’ve found this recipe (like the starter) is quite forgiving of my slapdash methods. Once I have a nice loaf of bread, a lot of problems are resolved around the house. Hungry? Have a slice of bread or toast. It’s always a good place to start. If you’re lucky, there might be an avocado or something else good to put on it! Pun aside: I’ve been making that no-knead bread, and it is terrific, but there are times I just miss that hands-on tactile relationship with bread dough. And yesterday was so cold and dreary, I didn’t want to go outside — just wanted to stay home and turn up the thermostat…. or turn on the oven! 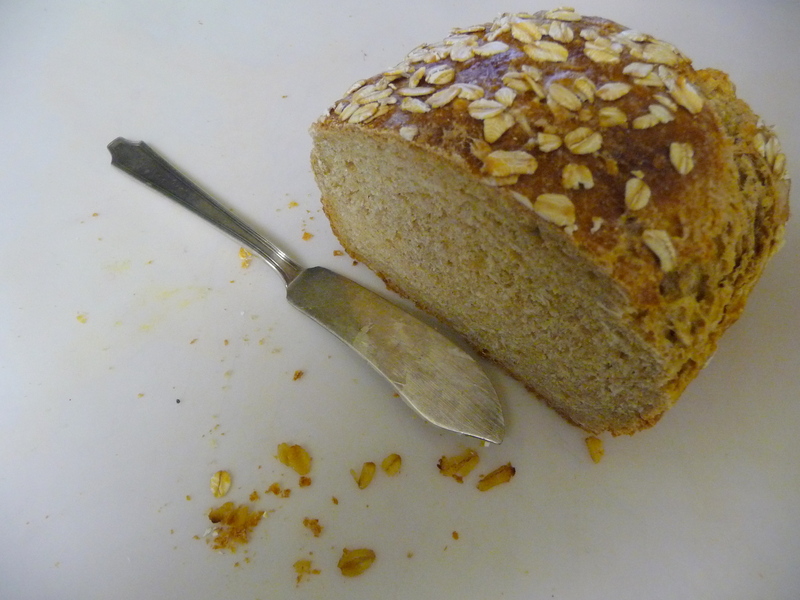 Oatmeal bread, a recipe I’ve had for years and years, was just the ticket. It called for two eggs, but I only had one. It called for light molasses; mine was pretty dark. The original recipe also called for milk powder, but I never have that. No matter. 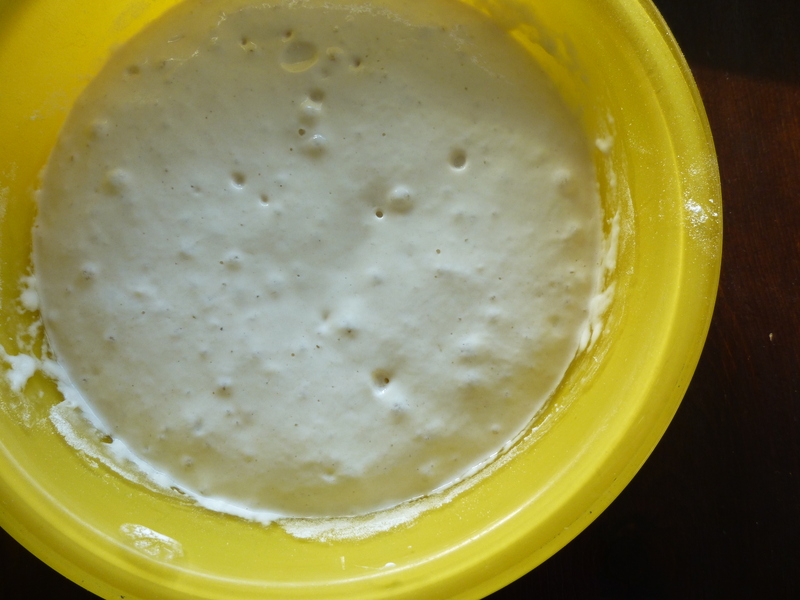 Dissolve the tablespoon of yeast in 1/2 cup of lukewarm water till bubbly. Stir in 2 cups of flour, add the 2 beaten eggs and the yeast mixture. Stir in enough flour to make a soft, but not sticky, dough. Turn on a floured surface, cover, and let rest for 10 minutes. Then knead until smooth. Let rise in a warm place until double — about 1 1/2 hours. Punch down. Coat 2 bread pans with oil and sprinkle a couple tablespoons of oats in each. 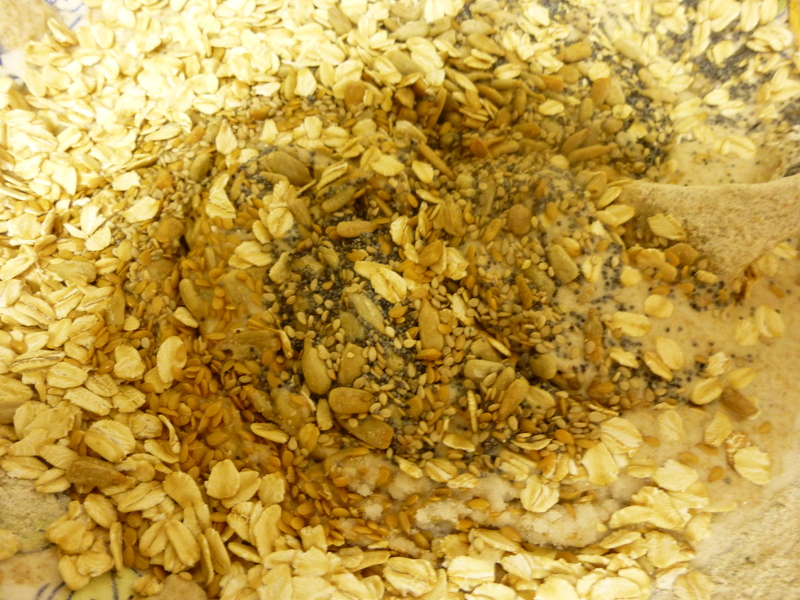 more oats on the top. Bake for about 40 minutes or until done. Check after 30 minutes and cover the tops with foil if they are getting too brown. See if you can let it cool a little before slicing! As soon as I read about this “pizza with a twist,” I knew I had to try it. 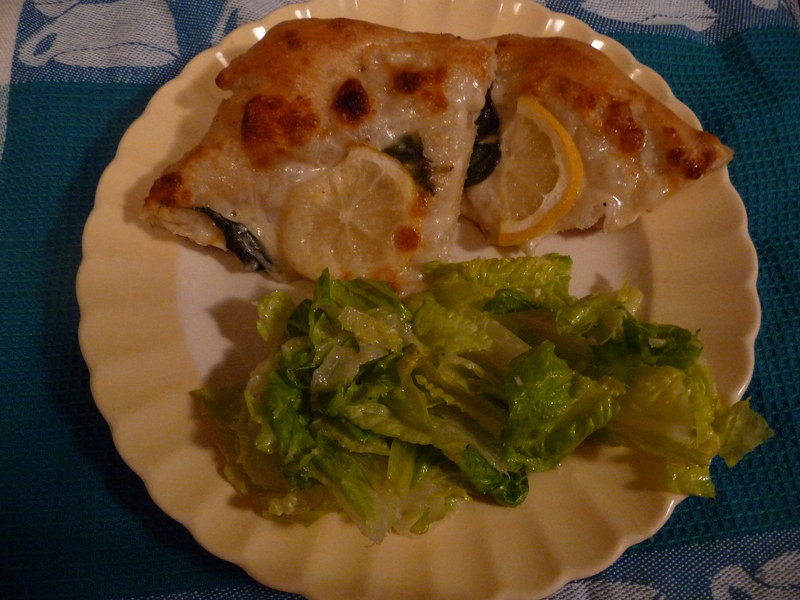 Lemons on pizza– what a natural for me, two of my favorite foods combined. But would it really be as good as it looked? 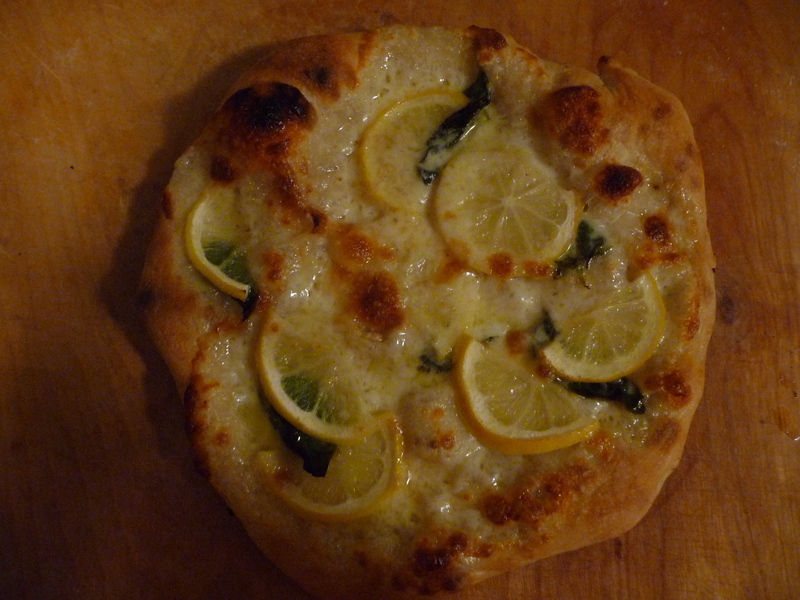 This recipe for “Pizza Sorrentina” (created by a fourth-generation pizzaiola in Naples for her mother Rosaria, who loved lemons) in the Wall Street Journal, gives directions for a homestyle version of the Naples-style crust, using 00 (doppio zero) flour, a very finely ground flour producing a tender and puffy crust. You bake it in an oven set to 550 degrees (pizza in Naples is baked in wood-fired ovens that reach 950 degrees). I don’t usually use the 00 flour for pizza, but I happened to have some so I did something that I very rarely do and followed the recipe. I also never buy smoked mozzarella, but this time I did that too. And I soaked thin lemon slices in water for 15 minutes, just like the recipe said. I have to say, this pizza was just terrific! Soaking the lemon slices meant that the peel was chewable, not hardened, and the sharp clean flavor of the lemons contrasted beautifully with the smoked cheese. One of the three 8-inch pizzas, along with the salad, was a fine dinner for the two of us. But one very hungry person could probably eat the whole pizza. Will I make it again? Sure, but I probably won’t follow the recipe to the letter next time. My regular pizza dough is a little different than this recipe, but I like it just as well. And I might use a different cheese, or another herb besides basil (though the basil is very good). However, I’ll definitely keep the lemons and I’ll definitely soak the lemon slices! 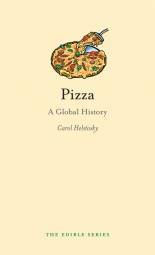 Want to read more about pizza? My press, Reaktion, has Pizza: A Global History as part of its Edible Series. Did you know that pizza wasn’t really an “Italian” food outside of Naples until well after World War II?